Twenty-seven Grey Nuns, Grey Nun Associates and friends enjoyed together the 20th annual Eco-Spirituality weekend at St. Gabriel’s Retreat Center in Clarks Summit June 22-24, 2018. Sister Sheila Stone, mainstay and powerful influence on the evolution of this weekend, traced its history on Friday evening after Mimi Palkovics led the group in prayer. Thanks to GNSH congregational financial support, we had a retreat day on Saturday. 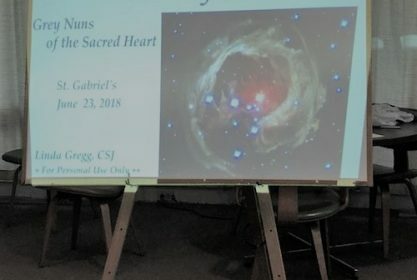 Guest speaker and retreat director Sr. Linda Gregg, SSJ, and her assistant, Sister Mary Rowell, SSJ, guided us in theological reflection framed in cosmology, that is, the “new story” of the earth and humanity’s relationship to the universe. Sister Linda referenced our Grey Nun spirituality of the Sacred Heart and Father Lowell Glendon,S.S.’s, exegesis on our metaphors as she instructed us on the story of creation as interpreted through indigenous cultures and through the Hebrew and Christian scriptures. realize the importance of lobbying for policy change that favors environmental protection. We shared hopeful experiences and thanked Mary Jane Key for making cloth bags (to avoid plastic) for all 27 participants. In the evening, Lucia Iacono led an activity that combined music, literature, and movement related to much of what we have been focusing on in the “new cosmology.” We sang along with some familiar lyrics like “From a Distance” and “Turn, Turn, Turn” and read selections from Thomas Berry as well as some children’s books about being mindful and truly present to the beauty of the natural world. We were also each invited to make a contribution such as a poem, a story, or a drawing to create a book for the weekend. Lucia supplied us with lots of seeds for creativity. Sunday morning following prayer, Mary Jane Key presented a powerpoint connected with the annual commitments from last year’s meeting, including eating less meat, reducing consumption, praying daily, and advocating for an issue related to climate change. We each evaluated ourselves on how well we have done since last year! support of our GNSH Social Justice Office priorities. Next year’s meeting will be the weekend of June 21-23, 2019. Check with Sister Sheila Stone or any “Eco Woman” if you’re interested in attending! All are welcome! View photos of the weekend, here!